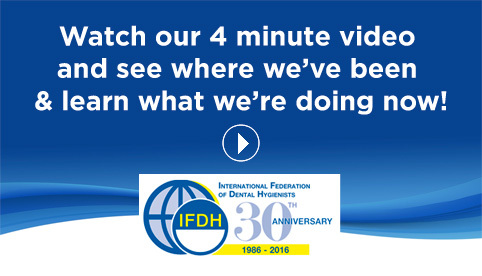 The International Federation of Dental Hygienists was officially formed on June 28, 1986 in Oslo, Norway. The forerunner of the IFDH, The International Liaison Committee on Dental Hygiene, was established in 1973, by some European countries (including the Netherlands, Norway, Sweden and the UK), the USA, Canada and Japan. The IFDH is an international non-governmental organization, free from any political, racial, or religious ties. It is incorporated and registered in the United States as a 501(c6) non-profit organization. It unites dental hygiene associations from around the world in their common cause of promoting dental health. Safeguard and defend the interests of the profession of dental hygiene hygienists, and represent and advance the global profession of dental hygiene. Promote professional alliances with its association members as well as with other interdisciplinary associations, federations and organisations whose objectives are similar. Promote and coordinate the exchange of knowledge and information about the profession, its education, evidence-based research, and best practice. Promote access to quality preventive oral health services and foster social responsibility programmes to enhance oral health. Increase public awareness that oral disease can be prevented through proven regimens and can have significant impact on general health. Provide an international scientific forum for education and networking the understanding and discussion of issues pertaining to dental hygiene. The IFDH is governed by its House of Delegates, which is comprised of 2 delegates from each Association Member. Normally the House of Delegates meets every three years, in conjunction with the International Symposium of Dental Hygiene, which is hosted and organized by a selected member country. A five member Board of Directors (president, president-elect, vice president, treasurer, and secretary), elected by the House of Delegates is responsible for the execution of those goals set forth by the House of Delegates during each three year period.